(SINGAPORE) - The blockbuster exhibition Yayoi Kusama: Life Is The Heart Of A Rainbow at National Gallery Singapore attracted long lines today (Sept 3) on its last day. If you missed the show, here were the highlights of the exhibition which featured more than 120 of the 88-year-old avant garde Japanese artist's works. This garden in the City Hall Chamber was made up of 1,500 stainless-steel balls distributed around the hall in clusters. The shiny balls reflected multiple images of the viewer back at himself, in an echo of the legend of Narcissus, the proud, beautiful boy who was punished by the goddess Nemesis for his vanity. She lured him to a pool where he fell in love with his own reflection and pined to death. Kusama first installed this work at the 33rd Venice Biennale in 1966, which caused an uproar as she had not been invited to exhibit. She put up a sign at the exhibit "YOUR NARCISSIUM (sic) FOR SALE" and sold each ball for US$2 to passers-by. A Kusama show often has an infinity room - a small, dark, mirrored space with glowing lights. While the basic concept stays the same, the rooms have evolved thanks to technology, and possibly legal considerations. The first infinity room this writer visited in Japan's Mori Art Museum in the 1990s was completely, blindingly pitch black and had strings of red Christmas lights that pulsed and faded to a heartbeat rhythm. Over the years, the infinity rooms have become merely dim, with visible pathways through the space and LED lights that twinkle, dim and even change colours. The incarnation at the National Gallery is pretty and Instagrammy rather than chilling and disorienting like the early version. The pumpkin is a favourite Kusama motif, inspired by her childhood growing up in a plant seed nursery. 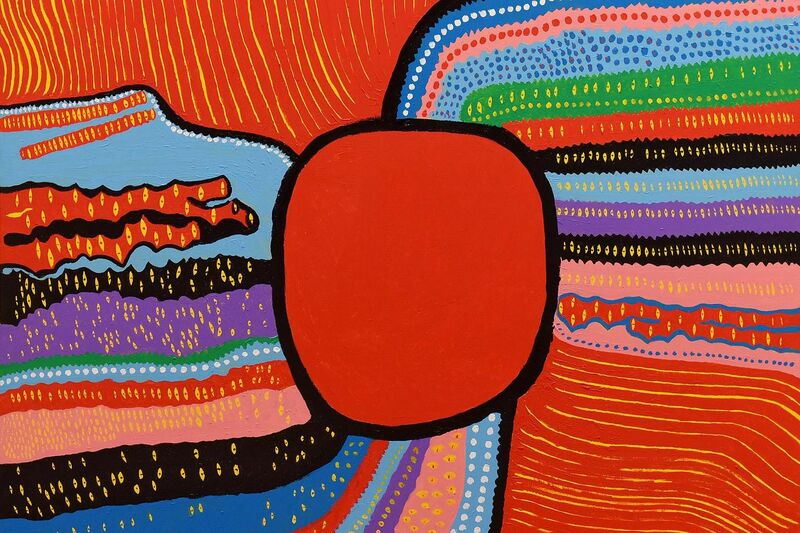 Her pumpkins are often neon bright and decorated with polka dots, another instantly identifiable Kusama motif. This work marries three of her recurring themes: pumpkins and polka dots, in an infinity room. 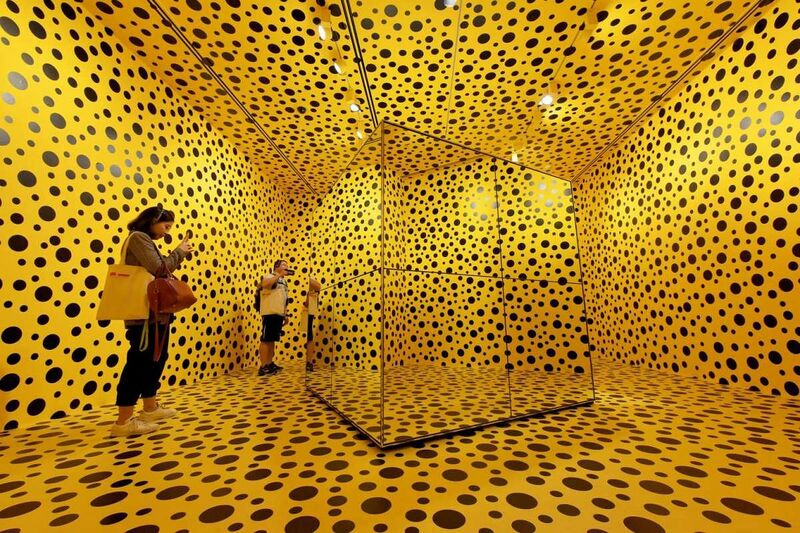 The yellow-and-black dotted room has a mirrored cube in the middle and when you peer in, glowing pumpkins stretch into mirrored infinity. This painting is a new piece after which the show is named. The vibrant colours, stripey arrangement and repetitive eye motif pop up in other works in this ongoing series titled My Eternal Soul. She has created more than 500 works in this series of oversized canvases painted in eyepopping acrylics. Kusama has been painting infinity nets, intricate looping details that cover entire canvases, since the late 1950s. 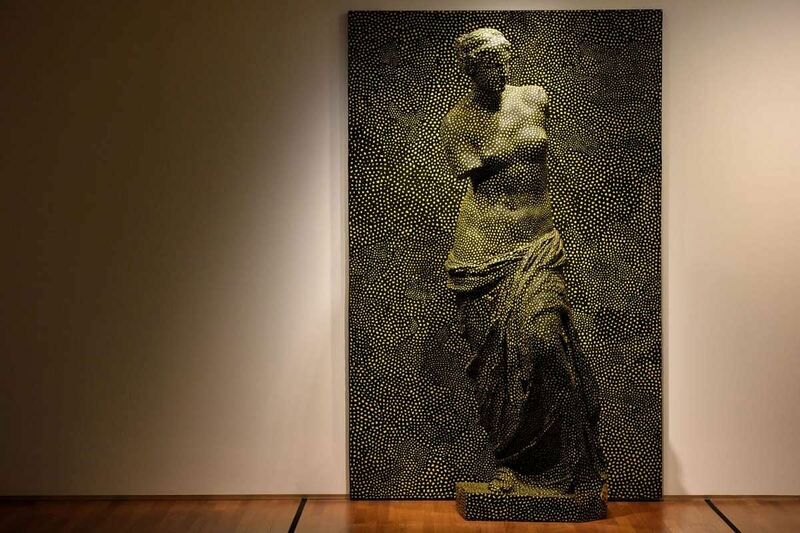 Here, she appropriates the traditional Greek/Western ideal of beauty and covers every centimetre with her infinity net motif. She has created several coloured versions of this work. This piece continues her exploration of gender and female identity, with the classic embodiment of a beauty ideal that simultaneously pops out of, and disappears into, the background. 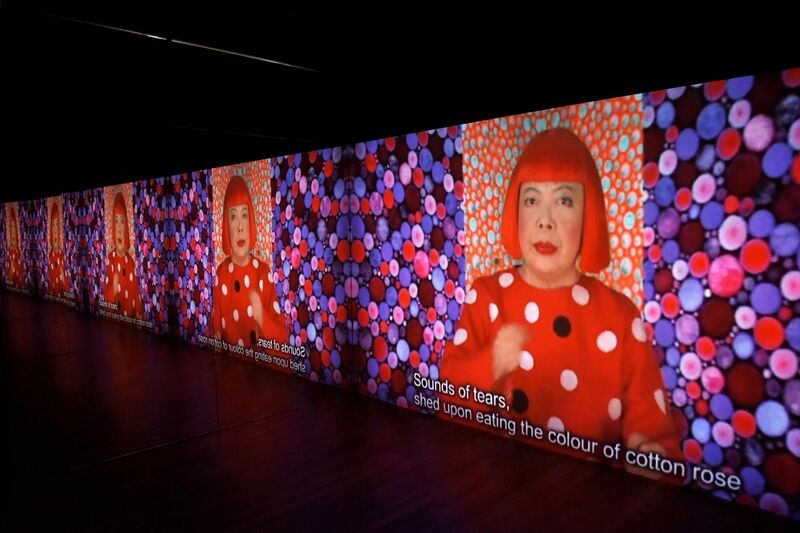 This video installation captures Kusama in a synthetic bright red wig and one of her signature polka dotted outfits, singing a song about her experiences with depression. With her thousand-yard stare and flat delivery, this was an unsettling work that highlighted the deeply personal nature of her art practice. The work's title is drawn from her debut novel, Manhattan Suicide Addict, which was published in 1978.